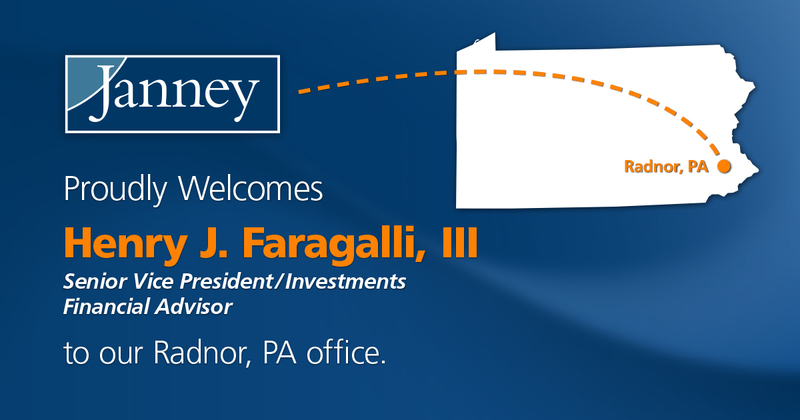 PHILADELPHIA, PA – October 2, 2017 – Janney Montgomery Scott LLC (“Janney”), a leading full-service wealth management, financial services and investment banking firm headquartered in Philadelphia, PA, announced that Henry J. Faragalli III, Senior Vice President/ Investments has joined Janney’s Radnor, PA branch office. Faragalli was previously affiliated with RBC Wealth Management in Conshohocken, PA. A 24-year industry veteran, he is entrusted with over $120 million in client assets. Faragalli is the third Financial Advisor to join Brown’s complex this year. Steven C. Victor and Lisa W. Fouraker, also previously affiliated with RBC Wealth Management, joined Brown’s Radnor branch office in May, 2017. Combined, Faragalli, Victor, and Fouraker produce over $1.7 million in annual revenue. Janney’s Radnor, PA branch office is located at 150 Radnor-Chester Road, Suite B100 Radnor, PA 19087.